Cornmarket Group Financial Services Ltd, one of Ireland’s largest insurance brokers serving the financial needs of Public Sector employees, has announced the roll-out of a new brand identity. The rebrand is part of a significant transformation programme being undertaken by the company and the new identity better reflects the company’s values and its offering in the market. 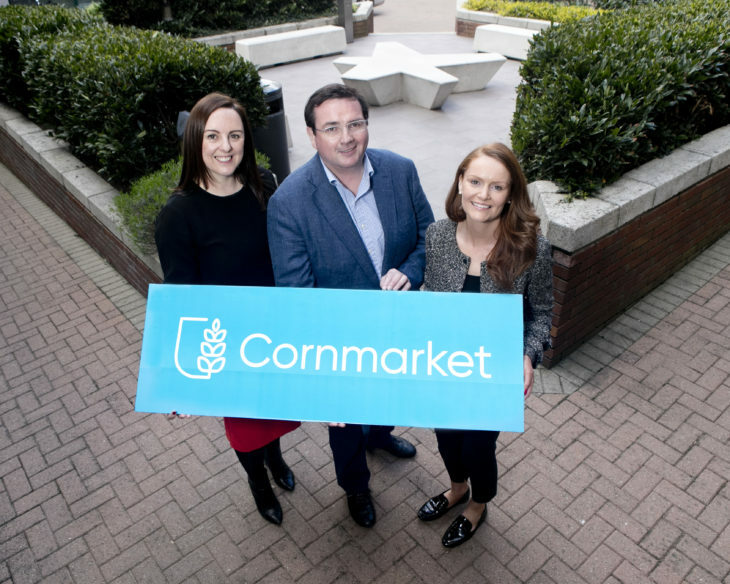 Commenting on the rebrand, Lisa Kelly, Head of Marketing said: “We are very excited about the launch of Cornmarket’s new brand identity which represents another significant step in the company’s evolution. This process is very much about communicating what we stand for, how we represent our customers and add value to their lives, as well as shaping the future for Cornmarket. In addition to the introduction of a new modern and contemporary logo, the brand identity will also be rolled out over the coming months across all of Cornmarket’s communications channels, from signage and marketing materials through to multi-platform digital channels later in the year. Employing over 380 staff with support offices nationwide, Cornmarket’s business focus is to help public sector employees and their families find the right financial products to suit their needs from car, home and health insurance to life insurance, income protection, retirement planning and more. Earlier this month, Cornmarket announced the availability of ‘Travel Plus’, a new worldwide travel insurance product for the Irish market, in response to the growth of the Irish travel sector.